One of the tools I teach my clients to utilize when they feel anxious is called Grounding. When your mind is racing mind, grounding brings you back to the here-and-now and is very helpful in managing overwhelming feelings or anxiety. It is a great way to calm down quickly. Grounding basically means to bring your focus to what is happening to you physically, either in your body or in your surroundings, instead of being trapped by the thoughts in your mind that are causing you to feel anxious. It helps you stay in the present moment instead of worrying about things that may happen in the future or events that have already happened but you still find yourself going over and over them in your head. There are many ways to ground yourself when you feel anxious and overwhelmed and I decided to describe the 7 grounding techniques that I have found work best for myself and my clients. Before I start describing some grounding techniques let’s talk about why grounding works and the science behind it. When we start to think about something stressful, our amygdala, a section of the brain located in the temporal lobe, goes into action. The amygdala, simply put, is the part of our brain that is responsible for our emotional responses, especially fear. It is great for preparing for emergency events but sometimes it kicks in to action and detects a threat where there really isn’t any. Here is a typical process; we have a negative thought about a situation (remember a thought doesn’t necessarily mean it is real), our amygdala says “emergency! emergency!” and initiates changes in our body such as increased muscle tension, rapid heartbeat and faster breathing. 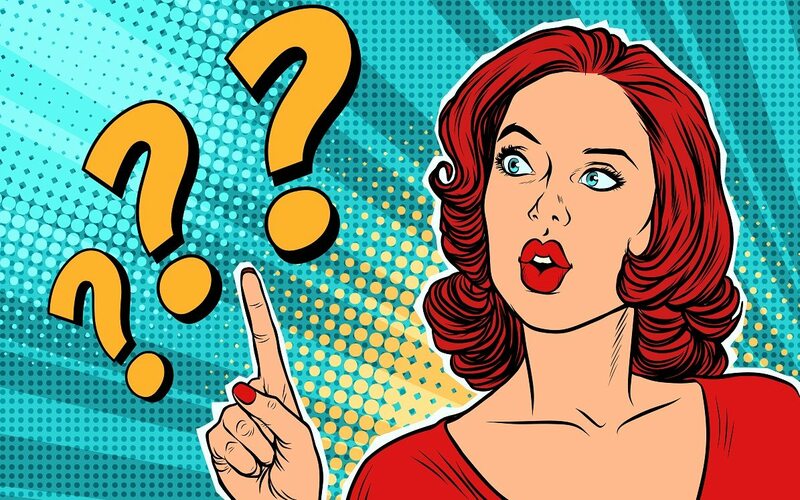 The amygdala then interprets these body changes as further evidence that something is actually wrong which of course further activates it and creates a vicious cycle where you become more and more anxious and physically and emotionally overwhelmed. Thankfully, we can use grounding techniques to break out of this vicious cycle. By re-focusing on your body and what you’re physically feeling, you get out of your head and divert your mind away from anxious or stressful thoughts and into the moment. I am going to describe seven different grounding techniques. 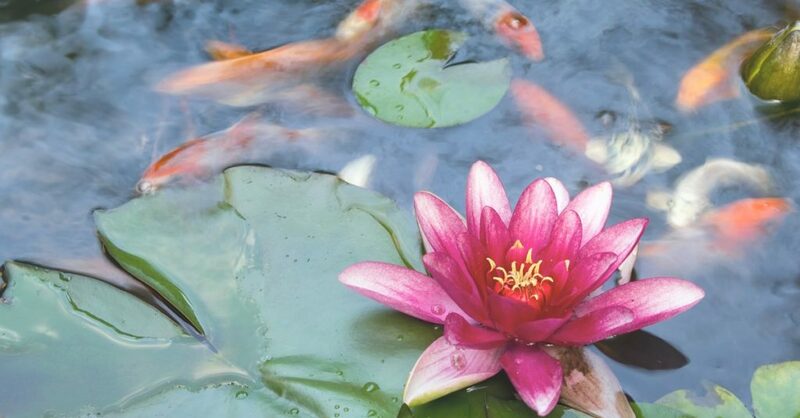 Practice them when you are slightly stressed or anxious so they will become familiar and then you will be able to launch into the technique that works best for you next time you are feeling stressed, overwhelmed or stuck in an anxiety attack. Sit down in a comfortable chair, one where your feet reach the floor. Close your eyes and focus on your breath. Breathe in slowly for the count of three, then out slowly. Bring your mind’s focus to your body. How does your body feel sitting in that chair? Scooch your bum right into the back of the seat so the whole length of your back is pressing into the back of the chair. Can you feel the contact between your body and the chair’s surface? If the chair has arms, touch it, is the material smooth or textured? Press your arms down the length of the chair arm, notice how your hands hang off the end. If your chair doesn’t have arms, touch the material on the seat, how does that feel? Next push your feet into the ground, imagine the energy draining down from your mind, down through your body and out through your feet into the ground. I picture it as a color filling my body as it goes from top to toe, but this is your image so choose whatever you want your energy to look like. As the energy drains from your head, feel how heavy each body part becomes, your torso feels heavy and now your arms as you relax those muscles. Lastly, feel the heaviness go down your legs, through your feet and down into the ground. This second technique gets you to use all your five senses to help you to get back to the present. It starts with you sitting comfortably, close your eyes and taking a couple of deep breathes. In through your nose (count to 3), out through your mouth (to the count of 3). 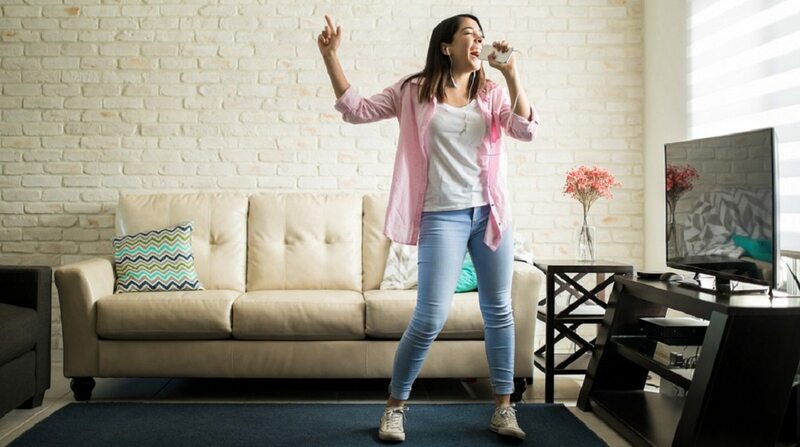 3 – things you can hear (traffic noise or birds outside, when you are quiet and actually listening things in your room constantly make a noise but typically we don’t hear them). 1 – thing you can taste (it might be a good idea to keep a piece of chocolate handy in case you are doing this grounding exercise! You can always leave your chair for this one and when you taste whatever it is that you have chosen, take a small bite and let it swill around your mouth for a couple of seconds, really savoring the flavor). Take a deep breath to end. 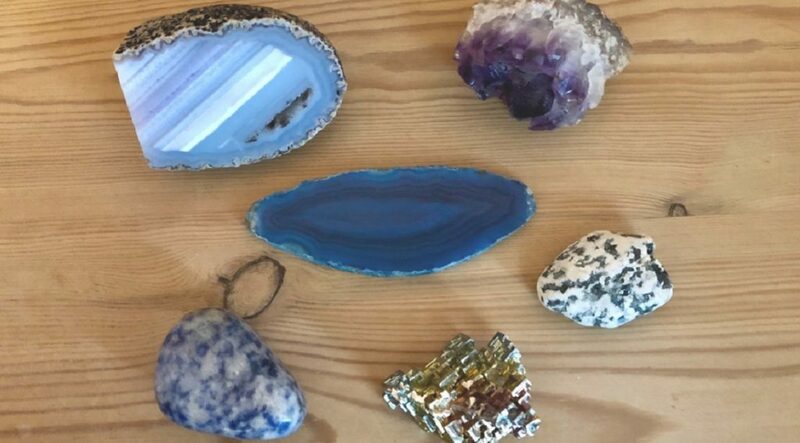 I keep gems and crystals in my office just for this purpose but look around your house for things that have a texture or are pretty or interesting to look at. Hold an object in your hand and really bring your full focus to it. If I was looking at one of my gems I would see the patterns that run through it, see the color variances. Some have veins of different colors going through the or sparkly bits. Look at where shadows may fall on parts of it or maybe there are shapes that form within the object. Feel how heavy or light it is in your hand and what the surface texture feels like under your fingers. This can be done with any object you have lying around or if you know you are going into a stressful situation, take one of your favorite small objects and put it in your pocket or purse so you can do this calming exercise on the go. When we are anxious our thoughts about our worries go around and around in our mind. Never ending and building on each other until we feel drained by them so we try not to worry. Whenever you try not to do something it is guaranteed to make you do it more so instead, observe your thoughts like you are an outside looking in. Just watch your thoughts for a minute. Imagines leaves floating on the surface of a stream. For each thought that comes to mind, allow that thought to take its place on a leaf and watch it blow away in the wind. Or allow the thought to turn into a fish and watch it float away down the stream. Allow those thoughts to come and go, you don’t need to respond to them. There are several ways to distract your mind so it stops thinking about whatever it is that is worrying you and focuses on something that isn’t emotionally driven. Here are my favorite two quick ways to do it. Pick a color. 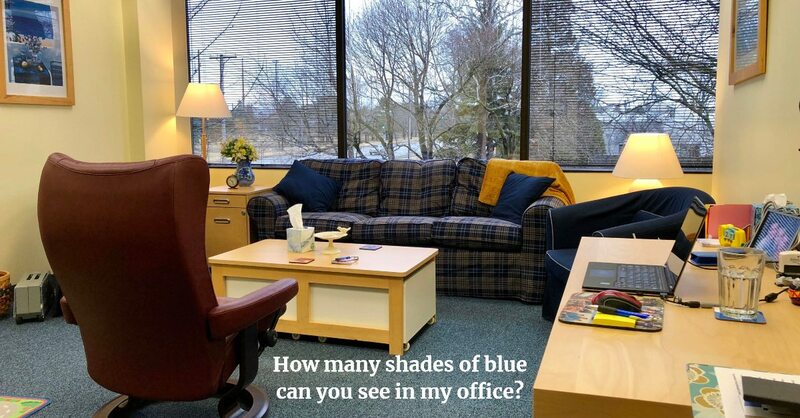 How many things in different shades of that color can you see around the room or out of the window? Still feeling stressed? Pick another color. Count backwards by 7, starting at 100. It isn’t that easy and needs you to concentrate. This one can also be helpful to do when you are finding it hard to sleep. Place your feet on the ground and in your imagination pick your favorite color to draw an outline around each foot. Start at the heel and using your imaginary pencil slowly go up the side of your foot to your pinky toe and then make sure you draw around each toe and then go back towards the heel. Repeat on the other foot. Another quick way to focus on your feet when you are in a stressful situation is just wiggle your toes inside your shoe. Pay attention to the sensation as you move each separate toe. Do some move independently of the others? Tense up your whole foot then stretch it out. Now do the other foot. As you can see, grounding helps you get out of your brain and bring your focus to your body. 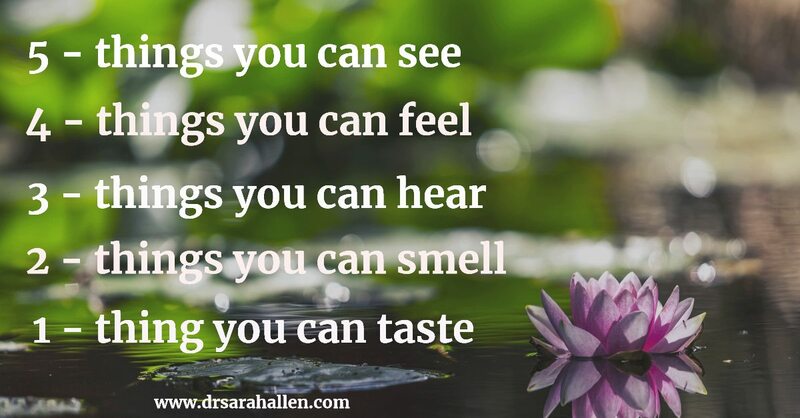 Try them all when you are only slightly worried about something and then chose the ones that you like best and practice them so they are easy to remember when you really need them. Sometimes my clients tell me that they just can’t concentrate enough to do any of these grounding exercises because their body seems too pumped full of adrenaline fueled energy. If this is happening to you, it is good to kick-start the calming down process by doing something physical first to get that pent-up energy out and then come back to your favorite grounding techniques. 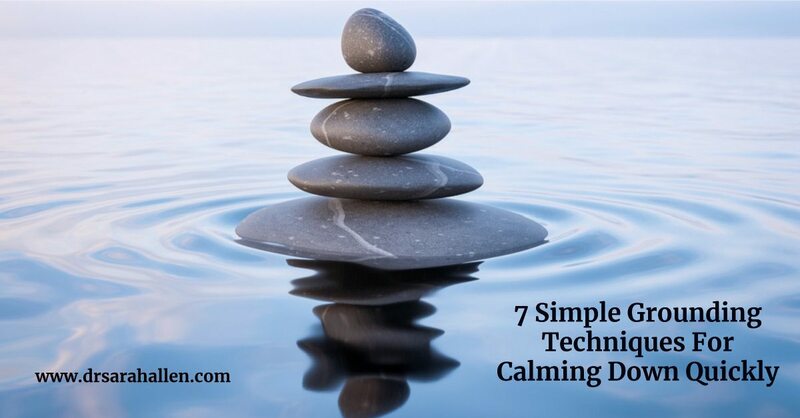 When you are physically spent, you can return to trying these techniques to calm down your mind. The Number One Question That Helps Reduce Worrying. 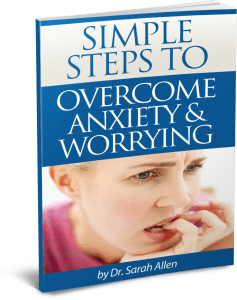 To find out more about coping with anxiety and worrying download my free booklet Simple Steps To Overcome Anxiety & Worrying use the sign up form below the book. 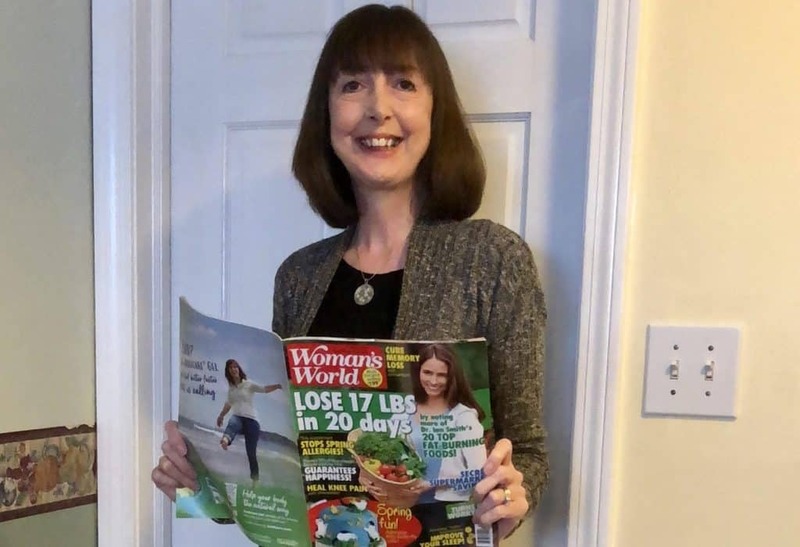 If after reading my blog posts or booklet you feel ready to start working on reducing your anxiety but need support, I can help you overcome worrying in one-on-one individual counseling sessions. Help! I Am Worried All The Time! 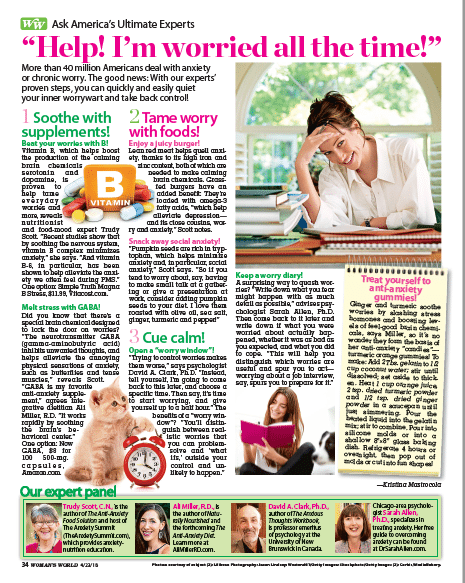 A few weeks ago I got an email from Kristina Mastrocola, Senior Editor at Woman’s World magazine, asking to interview me for their America’s Ultimate Expert page about things people can do to stop worrying. To say I was honored was an understatement! 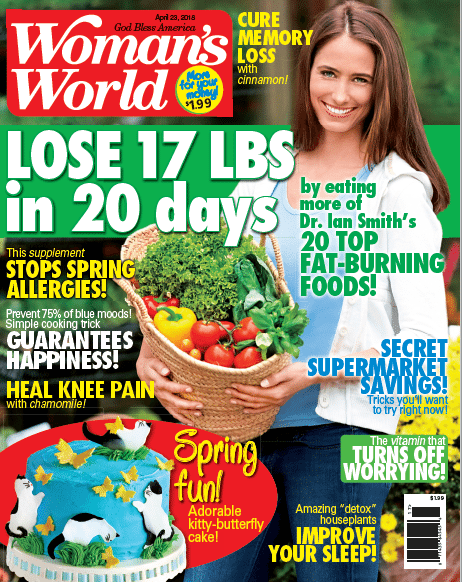 Woman’s World is a national magazine with a weekly readership of over 6 million! 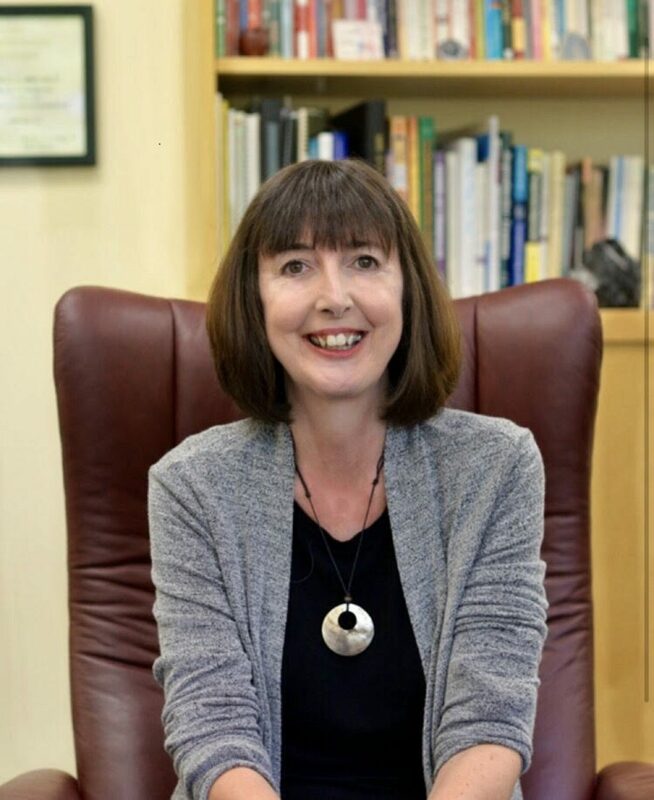 In the interview I discussed many things that I teach my clients that can help to reduce anxiety and worry and in the end only one small paragraph of what I said was published, but oh well, I am still excited to be included in their panel. Here is a photo of the article but it is hard to read so if you would like to read it just click the link.